Apple Smart watch 3 is a powerful and well-equipped product and has a good android where it can’t be beaten, but could have been better in the price range as other brands. This Apple watch was launched in 2016 . It has a decent display . It is 0.9mm thicker then it&apos;s previous variant . It has a screen size of 1.5 inch . Average battery life . Overall a nice product . 2 Pricebaba users have written their experience with Apple Watch Series 2 38mm. If you own Apple Watch Series 2 38mm, please do leave your feedback too. Apple Watch Series 2 38mm was launched in September 2016. Some of its key features are Siri, Notification support, Ion-X Glass, S2 processor and 5ATM certification. Apple Watch Series 2 and Series1 are nearly identical in design, except the Series 2 watch is 0.9mm thicker.The difference is noticeable only when both the watches are placed next to each other. Apple has continued with the same design for its second-gen smartwatches. Apple has packaged a 1.5-inch squarish OLED touchscreen retina display with a resolution of 270 x 340 pixels resulting in a pixel density of 290PPI.The display of the Series 2 is twice brighter than the Series 1. There are 2 two sizes on offer: 38mm and 42mm with 3 different case materials – Aluminium, Stainless Steel and White Ceramic model. The Series 2 is available in a range of colours: Gold, Rose Gold, Space Grey and Silver. Apple offers 3 different types of belts - Sport, Leather and Stainless Steel in a plethora of colours. Apple offers the Series 2 in Sport, Steel, Hermes and Nike+ editions. Display of the Apple Watch is shielded by Ion- X- Glass on the Sport and Nike+ edition and sapphire crystal on the Steel, Ceramic, and Hermes model, which protects it against scratches and damage. Certified with 5 ATM certification, this watch can be worn while swimming up to a depth of 50 metres. 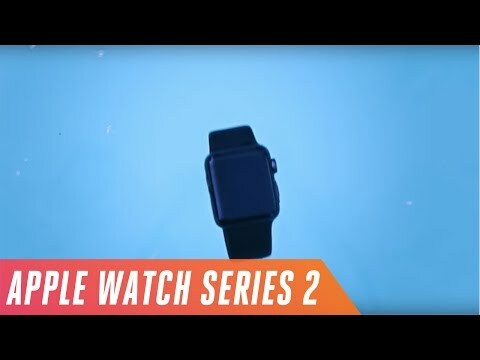 Apple powers the Series 2 watch by Dual-Core S2 processor and operates on Apple Watch Operating system 3, which can be upgraded to version 3.2.The watch is packed with a 512MB RAM and internal memory of 8GB. Some of its pre-built features include Heart rate sensor, Ambient Light Sensor, Gyroscope, Accelerometer, Speaker and Microphone, MP3 player, photo viewer, Fitness Tracker. You can also add music to the watch for a quick run via the Music app. Two new features have been introduced: GPS and auto lock. Auto lock is helpful in clearing the water that may have accumulated in the watch worn while swimming.You can make and receive calls via the watch. You can further download apps from the play store according to your requirement. The watch is powered by a 250mAh battery which lasts up to 18 hours of usage and includes a magnetic cable for charging. Users can experience connectivity Wi-Fi and Bluetooth. The watch works only with devices on Apple iOS. It is compatible with Apple devices running iOS 10 or iPhone 5 and above.